Lve the card..simple and elegant. Thank you for showing this great card! I say this every time, your cards are awesome! 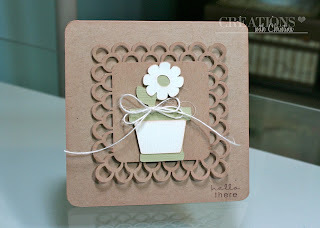 I love the layering of the same color with the pop dots sand distress ink. I would not have tried that. You're so clever! Beautiful card! I hope you have a wonderful day. Thanks again. I love this punch! May have to go and get one. Great tip...rolling the pop dot for adhering a ribbon! Pretty card. I have the Swirling Lace Punch Around the Page by Martha Stewart and I have the April Showers Cricut cartridge so I'm going to give it a try. Love the card, very simple and neat. Very pretty card, I love the clean look to it! Have a blessed day ;0). This is a really pretty card, love the colour choice. LOVE THE APRIL SHOWERS CARD. SO PRETTY AND SIMPLE. Very simply, but very beautiful card. Thanks for sharing this!! I really love your card. Plain and simple win me over every time! Super card and I love the border punch that you used with the simple flower pot. Great. I love this card. Thanks for sharing. You just do the cutest things. Love your little card and the cute little sentiment. Very sweet card. Really like the tone on tone color scheme. Also thanks for the info on how to use these punches. Listed you, Christina, as my inspiration for my today's 5/24 blog post. Thank you for the inspiration! You always seem to teach so much. Your color choices were splendid. This is an amazing card. Beautiful card!! Love the punch around you used - it frames the flowers so perfectly! I have that punch (but not the cartridge.) I'm sure I can figure out something to substitute for the cute little flower and pot (Hmmm, or maybe I need a new cartridge!) :) Thanks for your inspiration!